1869 H. Hanson, along with Michael Rehm, bought Charles Meyssans' French Camp (No. 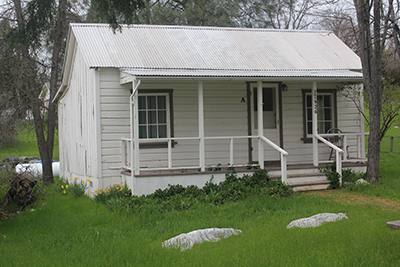 3) property on the South Fork of the Stanislaus River in, three years after the Meyssans moved to Columbia and took over Claverie's store across Main street (Paquette 1996:40). Historical Structure Note: Resting on a post and pier foundation, the c1870 residence has single walls with channel siding on the front, board and bat on the ends and rear, a pitched roof with galvanized metal sheeting, an open front porch with shed roof and 4x4 posts, and a small north end deck with steps that provide access to a small mudroom off the kitchen. The 23 feet by 20 feet original mass is rectangular with two rear additions on concrete slabs. The front wood panel door has one lite and a half-screen panel door offset to the right, opening into the living room, with the bedroom to the left. The windows are mostly nine-lite hinged wood frame, with 1940s horizontal wood frame windows on the rear additions. 1911 Herman J. Hanson (still?) owned the subject residence. (Eastman). 1946 Acquired by the State, the interior has been remodeled and the utilities upgraded for use as a park residence rental. The lot has exposed limestone bedrock, lilacs, oaks, grapevines, roses, iris, prickly pear cactus, California poppies, a salvaged red brick front walkway, and a wood post and ornamental wire fence and gates. The residence and lot are in very good condition and are recommended as contributors to a National Register District with local if not statewide significance. It is compatible with the NHL District, if not a contributor, representative of the Decline years when many town lots were re-mined and turned into residential lots. 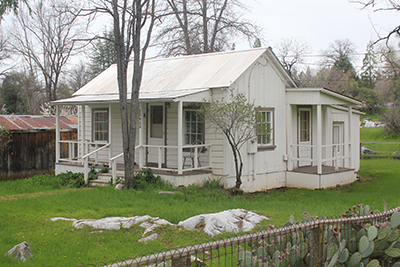 Park building records: From 1948 to 2010 the house has been repaired or upgraded as needed. This 539 square feet Frontier Vernacular residence faces east, across from the Claverie-Old Chinese Store ruins on north Main Street, in the historic French and Chinese section of Columbia. 2010 The House has been used as a rental for visiting tourists. One double bed, two twin beds.